Across the world, people have made arrowheads. Originally being chipped into shape from various stones, they have been made from bone and metal as well. 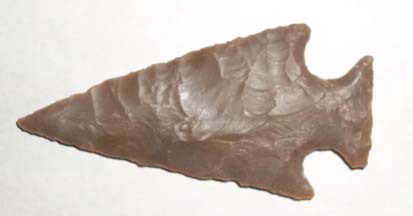 The type we know best (in Ohio) are those made by flaking flint into a familiar shape, and are often found in tilled fields after having been abandoned for many years. Flint arrowheads are ubiquitous in the Midwest and elsewhere, but the further south-west one travels the more likely you are to find those made from razor-sharp Obsidian. By their nature, being handmade, no two arrowheads are the same, and can be collected by hand or by purchasing them after being found. The value of these old artifacts varies wildly, but is kept low thanks to their sheer numbers. Older pieces typically can be more valuable, and the shape of the point also plays a part in pricing. Their inexpensive pricing, small size, and long history make them very easy to collect and display.